What is the proper balance between free trade and protecting the American economy? U.S. Trade Issues: A Reference Handbook is a timely exploration of this vital and politically sensitive question, one that emerged as a crucial issue in the 2008 presidential election. Written by a former chairman of the U.S. International Trade Commission, it provides an authoritative, accessible, and unbiased revi… ew of the defining events, principal players, and key controversies in U.S. trade policy.U.S. 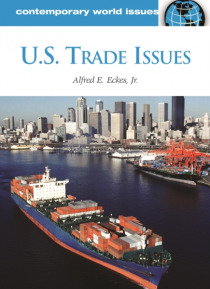 Trade Issues describes American trade policies from the days of the republic to the present, focusing most intently on the post-World War II era. It explores a number of current issues, including the Doha Round of Multilateral Negotiations, NAFTA, and the president's trade authority. In addition, the handbook looks at American trade policy in the context of an increasingly globalized world economy. Other ebooks releases by Alfred E. Eckes Jr.